For revenues inscribed Registration of Domestic Servants, see under Impressed revenue stamps. Kenya Telegraphs inscribed Uganda Railway are listed under Uganda. Acknowledgments for Kenya can be found on the main East Africa page. 1971 (recorded usage). Label inscribed DEPARTURE FEE (EXTERNAL PASSENGERS ONLY) PAID. Imperf. Note: the alignment of the text differs slightly between the two types. On A1 the final T of TICKET is below the H of THE, while on A1a it is below the T of THE. 1972 (earliest recorded example). Two aeroplanes. 42 x 31½ mm. Perf 13½. Watermark of rectangular mesh. 1975-80. View of airport. 42 x 31 mm. Perf 14½. No watermark. Security underprint in turquoise ink reading O P & C M (letters ½ mm high) and GENUINE (2 mm high). Printed by De La Rue. Value and inscriptions in black, design in grey, background colour given. 1. The dates of issue given here derive from the De La Rue proofs in the Crown Agents archive in the British Library: the 20s was approved on 22nd April 1975 and the 80s on 28th February 1980. It is not known when the reprints without security underprint were issued. 2. Cylinder numbers recorded: 20s (A7) 1B1B, 80s (A8) 1A1A. c1983. Provisional handstamp surcharges on A8. Note: the 100s on 80s surcharge is also known as a manuscript provisional. Other handstamped versions may also exist. 1984-90s. View of airport. As previous issue but change to perf 13½. Underprint as before but less prominent. Printed by Harrison. 1. The date of issue shown here is based on the Harrison proof of the 100s in the Crown Agents archive, which was approved on 12th March 1984. It is not known when the other values were issued. 2. Cylinder numbers recorded: $10 (A13) 1A1A1A. 3. Gibson lists a 50s value from this (perforated) issue, but I believe this is an erroneous listing for my A21. c1985. View of airport. As A13 but imperf. Underprint as before. Denominated in US dollars, with serial number in black at lower right, consisting of six digits with no letters. 1985 (according to Gibson). View of airport. 41 x 30 mm. Imperf. No watermark. Self-adhesive, with cross-shaped security puncture to prevent re-use (except A22). Faint security underprint in turquoise ink reading O P & C M (letters ½ mm high). Value, inscriptions and serial number (at lower right) in black, design in grey, background colour given. Note: the pink of A23 is so pale that the turquoise security underprint tends to dominate, making the stamp appear pale green. Gibson lists this stamp as being green and black. c1990 (according to Gibson). Elephant and mountains, inscribed KENYA GOVERNMENT at top. 41 x 30 mm. Imperf, with deckled edge at top. No watermark. Self-adhesive, with cross-shaped security puncture to prevent re-use (the serial letter is also punctured into the stamp at right). Design multicoloured, with inscriptions and serial number in black. KENYA and value in colour given. 1993 (earliest recorded example). As A31/2 but inscription at top changed to KENYA AIRPORTS AUTHORITY. 1. The word INTERNATIONAL is centred relative to the elephant's tusk on A32 and A36, and relative to the elephant's flank on A32a. The two types can also be distinguished by the security numbers, which are in a bolder thicker font on A32a. These seem to be two different printings and it is not known which was issued first. 2. The face value on A34/5 is shown as KSHS50. A34 is presumed to have been issued without the 100s provisional surcharge but I have not seen an example. Labels stuck on bottles or cigarette packs to indicate the payment of alcohol or tobacco duty. c2005-2010. Alcohol excise. Arms of Kenya and lion device, with letters KRA (= Kenya Revenue Authority). 34 x 11 mm. Imperf. No watermark. Silver hologram strip at foot and security number in black. 2010 (first recorded usage). Tobacco excise. Arms of Kenya and lion device, with letters BAT (= British American Tobacco) inverted at top. 34 x 11 mm. Imperf. No watermark. Silver hologram strip at top and security number in black. Wide margin around design. Note: the above listing requires further development, and readers are encouraged to consult the Kenya page on Andrey Vasiunin's excellent website Tax Stamps Collection. 1963 (see note 1). 19½ x 22½ mm. Perf 14 x 14½. No watermark except where indicated. Printed (recess) by De La Rue. c1967. As G1/18 but different colours. 19½ x 22½ mm. Perf 14 x 14½. No wmk. 1964 (earliest recorded usage - see note 1). Different colours again. Contour lines behind value as G12/18 and G32/38. No mauve underprint. Wmk Mult Crown and Block CA. 1. The numbering of the above series should be regarded as provisional, since the lack of official information and the shortage of dated examples makes it difficult to establish the sequence of these issues. The dates given here for G1/38 are as suggested by Gibson, who suggests that G1/8 and G12/18 were issued simultaneously, and that later G21/28 were issued simultaneously with G32/38. ​2. G1/18 are commonly found as mint stamps with remainder overprint MSA02. I have not seen any examples of G12/18 without this overprint. 3. I have seen used examples of G2/6 and G8 which appear not to have the mauve background lines. It is possible that the lines were printed in water-soluble ink. 5. Gibson lists a 4s brown with mauve underprint plus the following values, none of which I have seen: 6s yellow and green, 9s red and black, 13s purple and green, 13s blue-grey and brown. Hoffman illustrates a used 4s stamp, but he does not specify the colour. 6. G1/8 and G21/28 have a phosphor underprint reading FRAUD in letters 1mm high across whole surface of each stamp. Further insight into understanding these issues would be welcome. Hoffman illustrates an impressed stamp inscribed Graduated Personal Tax NCC (= Nairobi City Council), suggesting that this could be a proof of a new issue. He lists values of 4s, 6s, 9s, 13s and 20s. These are not known as issued stamps. 1966. Small vertical key type inscribed KENYA HOSPITAL TAX. 19 x 22 mm. Printed by Bradbury Wilkinson. Note: the proof in the Crown Agents archives was approved on 18th March 1966, and the stamp was presumably issued later that year. Crown Agents proofs: H2/6, H8, H11/18 and H20 are currently known only from proofs in the Crown Agents archives in the British Library. No issued examples of any of these issues have been recorded to date. A proof of H9 and frame-only proofs for the 1975-78 issue exist in private hands and are illustrated above the relevant listings. 1967. Similar to H1 but changed to horizontal format. Inscribed KENYA HOSPITAL INSURANCE, with INSURANCE at foot of stamp below the value. Note: the proof in the Crown Agents archives was approved on 25th April 1967, and the stamp was presumably issued later that year. 1968-74. Similar to 1967 issue but slightly redrawn with INSURANCE above the value, and now showing a pair of dates eg 1970-71 to indicate validity. 22½ x 19 mm. Perf 14 x 13½. No watermark. Printed by Bradbury Wilkinson. 1. The note above H2 applies to H3/6 and H8. 1975-78. As 1968-75 issue but with background slightly redrawn and printed by House of Questa. 1. The note above H2 applies to this issue. 2. Frame-only proofs in orange-red and deep blue exist in private hands and are illustrated above. Hoffman illustrates another proof of a hospital revenue, this time with a coat of arms motif and inscribed KENYA NHIF. The letter H (meaning uncertain) appears at lower left and the stamp is denominated 20 shillings. No issued stamps in this design have been recorded. 1979. New design featuring rosettes similar to H16 below but in small horizontal format (21 x 17.5mm). Inscribed KENYA at top, HOSPITAL INSURANCE at sides. Printed by House of Questa on fluorescent fibre paper. 2. The proof in the Crown Agents archives was approved on 28th June 1979. 1980-84. As H15 in similar design but now in larger horizontal format, with a different background pattern for each year. Inscribed KENYA NATIONAL HOSPITAL INSURANCE FUND. Printed by House of Questa. 1. H17/8 and H20 are currently known only from proofs in the Crown Agents archives in the British Library. No issued examples of any of these issues have been recorded to date. 3. The Crown Agents archives cease after this issue, and no proofs are held for issues inscribed 1985-86 onwards. It is presumed that similar stamps were issued for 1985-86 and 1986-87, though it is not known whether these were similar in design to H16/20 or to H199/201. 1987-90. Shields. 34½ x 21 mm. Perf 15 x 14, with one wide perf in the middle of each horizontal row. No watermark. Cross in red. Note: illustrated above right is a 10s value in similar design but of uncertain status, which was first reported by Taddeo Papi in the June 2017 edition of The Revenue Journal. It has no dates, and the letters HCF appear in the corners in place of NHIF. 1990/91. Mount Kenya. 34½ x 21 mm. Perf 15 x 14, with one wide perf in the middle of each horizontal row. No watermark. Cross in red, inscriptions in grey and black. 1991/92. Mount Kenya. As previous issue but dates changed. 34½ x 21 mm. Perf 15 x 14, with one wide perf in the middle of each horizontal row. No watermark. Cross in red, inscriptions in grey and black. 1992/93. Nyayo Monument, Nairobi. 34½ x 21 mm. Perf 15 x 14, with one wide perf in the middle of each horizontal row. No watermark. Cross in red, inscriptions in black. 1993/94. Similar to previous issue but with inscriptions rearranged. 34½ x 21 mm. Perf 15 x 14, with one wide perf in the middle of each horizontal row. No watermark. Cross in red, inscriptions in black. 1994/95. NHIF flag with Nyayo Monument, Nairobi. 34½ x 21 mm. Perf 15 x 14, with one wide perf in the middle of each horizontal row. No watermark. Cross in red, inscriptions in black. 1995/96. Similar to previous issue but with inscriptions rearranged. 34½ x 21 mm. Perf 15 x 14, with one wide perf in the middle of each horizontal row. No watermark. Cross in red, inscriptions in black. Cylinder numbers recorded: 30s 1B1B1B1B, 40s 1B1B1B1B, 120s 1B1B1B1B, 180s 1A1A1A1A, 200s 1A1A1A1A, 220s 1B1B1B1B, 240s 1B1B1B1B. 1996/97. Similar to previous issue but with inscriptions again rearranged. 34½ x 21 mm. Perf 15 x 14, with one wide perf in the middle of each horizontal row. No watermark. Cross in red, inscriptions in black. Cylinder numbers recorded: 40s 1A1A1A1A, 80s 1A1A1A1A, 160s 1A1A1A1A, 200s 1A1A1A1A, 220s 1A1A1A1A, 300s 1A1A1A1A. 1997/98. Similar to previous issue but with inscriptions again rearranged, and incorporating a security number at lower right. 34½ x 21 mm. Perf 15 x 14 (all perfs normal). No watermark. Cross in red, inscriptions and serial number in black. 1998/99. National flag and Uhuru Gardens Monument. 35½ x 21½ mm. Roulette 13½. No watermark. Cross in blue, inscriptions and serial number (below centre) in black. 1999/2000. National flag and Kenyatta National Hospital. 37½ x 23½ mm, with background extending into margins. Perf 15 x 14. No watermark. Multicoloured, with cross in blue and serial number (below centre) in black. Background colours given. 2000/2001. Proposed NHIF Headquarters building. 35½ x 21½ mm. Perf 13½ (30s, 80s, 160s, 280s, 300s, 320s) or 13 (others). No watermark. Multicoloured, with cross in blue. Serial number (at lower left) in black, beginning with two letters. Background colours given. 2001/2002. As previous issue but dates changed, and no letters preceding serial number. Perf 13. 1995-96 (recorded usage). Mount Kenya. Inscribed HUDUMA / SERVICES CHARGE. 18½ x 21½ mm. Perf 12. No watermark. 1. The exact purpose of this issue is not clear, but may be related to an initiative to offer government services through local Huduma Centres similar to post offices. As of October 2018 there are 52 such centres across the country, each offering a range of public services such as certification of births, driving licence applications and registration of business names. The centres now in operation were established under a programme launched in 2013 and do not use adhesive stamps for payment, but it is possible that a similar scheme existed in the 1990s and that the stamps listed here as C1/12 were used in that context. 2. C1 and C9 are found on postal covers (where charges were incurred for unpaid postage) dated 1995-96, though the date of issue may have been some years earlier. 2. Most recorded examples are handstamped or overprinted with the digits 001, which probably indicates the post office in which the stamps were sold or used. 1. The two types of the 1s50c differ from each other in size, Z9 being slightly smaller than Z8. The design of the later type is also coarser, with less detail visible on the lion and the mountains. The 1s50c essay shown above right is a different type again, though this is not currently known as an issued stamp. 2. Barber illustrates proofs of a complete set of values including a 2s50c and £100, but I have not seen these two values as issued stamps. 3. Barber also lists a 30c value in both blue and red, but I have not seen these. 4. I have seen an example of the 20c vermilion with year plug at foot, used in 1954, but I am unable to illustrate this at present. Illustrated here are proofs (ex De La Rue archive) for impressed stamps denominated 2s and 5s inscribed Registration of Domestic Servants. It is not known when they were prepared, or whether they were ever issued. No other examples have been recorded to date. 1955-69. Receipt stamps used on cheques. Note: for an impressed stamp similar to Z36 but reading DUTY PAID (without KENYA), see Z16 of Tanganyika-Tanzania. 1973 (earliest recorded usage). Square meter stamps reading KENYA REVENUE at top, value in centre, code letters and numbers at foot. Note: separate values are not listed since the use of printed meters allowed any value (presumably up to 99s99c) to be produced. 1998-99 (recorded usage). 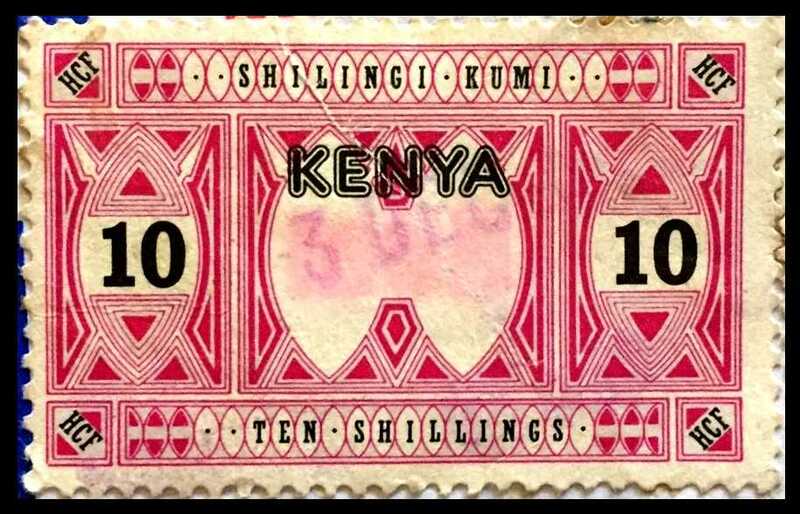 Rectangular meter stamps reading KENYA REVENUE and either SHILLINGS or POUNDS at top, value in centre, code letters and numbers at foot. 1. Separate values are not listed since the use of printed meters allowed any value to be produced. 2. The type inscribed POUNDS may have been an error for SHILLINGS since the pound (formerly worth 20 shillings) was not used in Kenya after Independence. 1928-30 (earliest and latest recorded usage). King George V postage stamps inscribed Kenya and Uganda, overprinted Kenya Judicial. Perf 14. Watermark Multiple Script CA (sideways on shilling and pound values, with crown to the left of 'CA' when seen from the back of the stamp). Overprinted locally by unknown printer. Kenya in capitals on all values, Judicial in mixed case (cents values) or capitals (others). (For similar stamps with slightly different overprints, see J21ff). 1. J12a is very similar to J12, the overprint having the same overall dimensions but using thinner letters with less pronounced serifs (see enlarged illustration above right). 2. Koeppel additionally lists the 2s50c, 7s50c and £2 overprinted KENYA JUDICIAL, though he does not distinguish between the local overprint and the De La Rue type. I have not seen any of these values with either type of overprint. 1928-30 (earliest and latest recorded usage). As previous issue but overprinted in capitals by De La Rue in London. Note: illustrated at right (low-definition image – no other available) is a set consisting of all the values listed above (J21/37) plus the 20c, 50c, 75c and 1s, opt Specimen. These last four values are not known as issued stamps and it is possible that they were not sent to the Colony, though the 50c and 1s are listed by Barefoot. He also lists the £5, £10 and £50 with similar overprint, but I have only seen these values with the local overprint (see J1ff). 1936. Large Nyasa key type featuring the portrait of King George V. 25½ x 30 mm. Perf 14. Watermark Multiple Script CA. Printed (typo) by De La Rue. The first printing of this stamp was despatched to Kenya in December 1935, so it presumed that it was issued in early 1936. A reprint was sent to Kenya in May 1937. 1938. Similar type but portrait changed to King George VI. Perf 14. Watermark Multiple Script CA. The first perf 14 printing was despatched to Kenya in November 1937, so it presumed that it was issued in early 1938. This was then reprinted in 1938, 1940 and 1946. 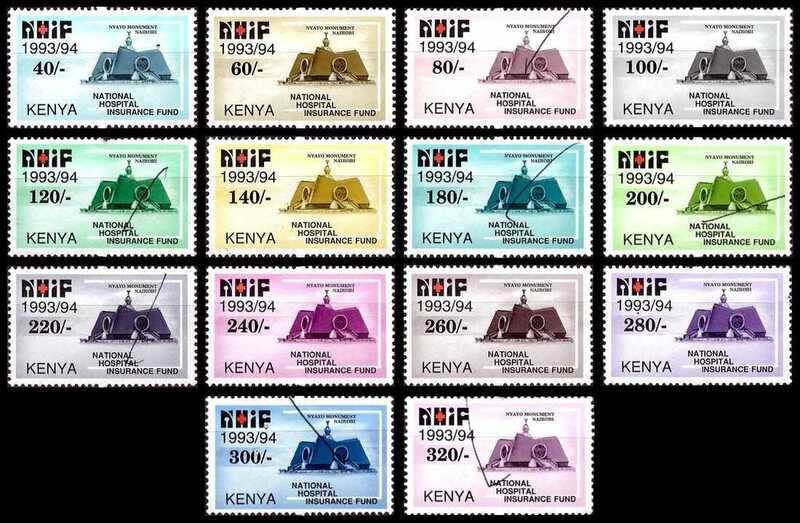 The perf 13 stamps were executed in one printing but sent to Kenya in two despatches in November 1949 and January 1950. Shades of the perf 14 stamp are known. 1954-59. Similar type but portrait changed to Queen Elizabeth II. Perf 13. Watermark Multiple Script CA. The dates of issue are based on the Crown Agents requisition data. The 5s is known from the archives but I have not seen an issued example. c1954. Queen Elizabeth II first pictorial issue, overprinted KENYA REVENUE (KENYA 14½ x 3 mm, REVENUE 19 x 3 mm). Perf 12½ x 13 (10c to 1s), perf 13 x 12½ (2s to 10s), perf 13½ x 13 (£1). Watermark Multiple Script CA. Note: Barefoot also lists the 10s with overprint reading downwards but I have not seen this. 1956-59. Lion on white background. 18 x 23 mm (10c to 20s) or 26 x 30 mm (25s). Perf 11½. Watermark Multiple Script CA. Printed (recess) by Bradbury Wilkinson. Note: The proofs for the 10c to 20s were approved on 19th January 1956, and it is assumed that the stamps were issued later that year. The proof of the 25s was approved as a new value on 18th September 1959, so the stamp probably came into use later that year or early in 1960.
c1963. As previous issue but watermark changed to Multiple Crown and Block CA. Note: Barefoot also lists the 10s on Block CA paper. Illustrated above right is an example of the 10s in a brighter shade than R27 and with what seems to be a very faint watermark. This may be Block CA but it is too faint to identify. 1977. As previous issue but design reduced to 17½ x 21 mm. Perf 14. No watermark. Printed (recess) by Walsall Security Press. 1. The proof in the Crown Agents archive in the British Library was approved on 14th November 1977, and it is assumed that the stamps were issued before the end of that year. 2. Barefoot also lists the 20c, 50c, 1s, 2s, 5s and 10s from this printing, but I doubt these could exist since the 10c is the only value known to have been proofed by Walsall. 1981 (earliest recorded usage). Heraldic lion on coloured background. 17 x 19½ mm. Perf 14. No watermark. Printed by Walsall Security Press. 1. Proofs of all the above values except the 20s were approved on 5th December 1979. The 20s in pale olive was approved on 19th December 1979, the original proposed colour of yellow having been rejected. Barefoot lists all these extra values except the 25s, though I have not seen any of them as issued stamps. He also lists a 10c red but I believe this is an error. 2. The 10c is known postally used. 1985 (earliest recorded usage). Similar format but featuring naturalistic lion. 16½ x 20½ mm. Perf 14. No watermark. Printed by Walsall Security Press. Note: the 1s is known postally used. 1995 (earliest recorded usage). As previous issue but change to perf 15 x 14 and slightly larger (17 x 21 mm). Printed by BDT International Security Printing Ltd, Dublin. Note: the earliest recorded usage of this issue is the 10s on a postal cover which arrived in the UK on 28th July 1995. The revenue adhesive was rejected and a surcharge applied. 2001 (earliest recorded usage). Perforation again changed to perf 13 x 13½. 16½ x 20½ mm. Screened background. 1. The sheet number is prefixed by a letter in the upper sheet margin above the third stamp from the right. This is A on the 2s, C on the 10s, D on the 20s, E on the 25s, F on the 100s, and presumably (though I have not seen this) B on the 5s. 2. The 10s, 20s and 25s were first recorded in 2010, when they were available at the Kenya Revenue Authority in Nairobi, but they must have been issued some years earlier. The 20s was still in stock at the KRA in October 2018, suggesting that this value was not reprinted in redrawn types as R95 or R105/110. ​with KENYA larger and lion heavier with less definition. Perforation again changed to perf 13 x 12½. No watermark. c2007-10. Design significantly redrawn, with thinner lettering and lion now rather impressionistic, the R of REVENUE level with the top of KENYA. Narrow format (15½ x 20½ mm). Perf 12½ x 13½. No watermark. Fluorescent security underprint KRA (= Kenya Revenue Authority) just above EN of KENYA. 1. The 2s value was first recorded around the year 2007. All three values were available at the Kenya Revenue Authority in Nairobi in 2010, but in October 2018 the KRA had only the 2s value in stock along with the 20s of the 2001 issue (R88). This may suggest a phasing-out of adhesive revenue stamps, especially for high-value transactions. ​2. All the sheet numbers I have seen (for all three values) are prefixed by the letters AA. 3. R105 can be found in a range of shades and with different types of gum from matt to glossy.